Green Glue is the highest-performing viscoelastic damping product of its kind. It has an excellent low frequency sound barrier and is one of the most effective and trusted noise-proofing compounds on the market. Green Glue is a water-based vibration dampening material and may take seven to 28 days to achieve maximum performance. 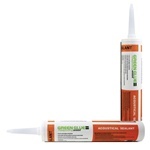 Green Glue acoustical caulk is specifically designed to reduce noise reverberations in many environments and is used on ceilings, floors, walls and joints of all kinds. Green Glue noise-proofing compound is reliable, extremely effective and affordable for any budget. 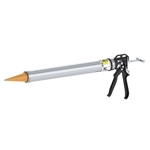 Order Green Glue acoustical caulk dispensers and sealant by the canister or in bulk for larger jobs directly from our online store. We have everything you need and the expert knowledge to help you get the job done right the first time. Buy now or contact us for more information.